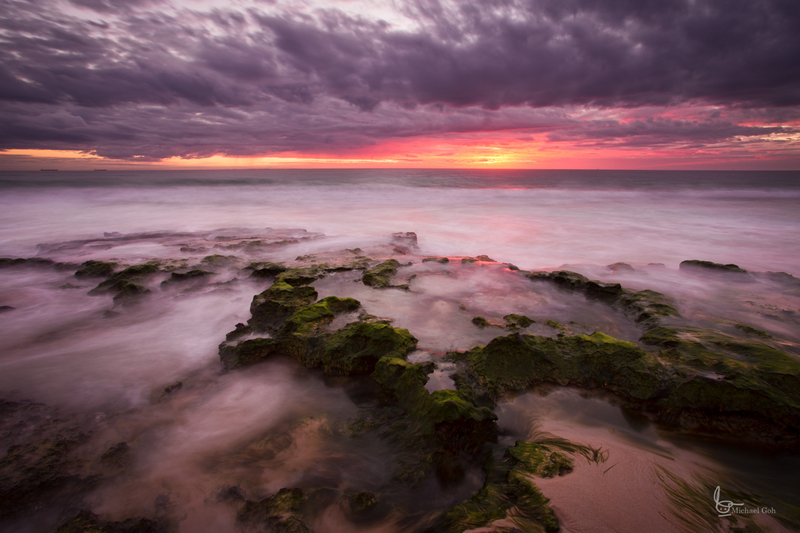 I was out at North Cottesloe beach (Perth, Western Australia) to take photos of the sunset. The rocks are very exposed at this time of year and for the next few months. Made a little more interesting due to the green. Normally when I go out shooting, I try to remember to take images with a few different techniques – more noteably – single frame, bracketing (for HDR or luminosity masking), using ND filters (graduated) and black carding. However despite walking the scene a bit looking and visualising compositions and anticipating the light – still keep falling into the trap of shooting for immediacy of the moment and not thinking through what I really want in terms of the visualisation. I used to have a friend who when said they wanted to stop with the initial excitement of the scene in front of them and think more about the scene. Walk around more and using the right filter for the job. Usually they just popped out the 3 stop soft nd grad filter and took the shot from the first places that grabbed their attention – more like “ooh shiny thing”. Sometimes it’s good actually going out to shoot with people that you respect to actually remind you to shoot with your mind and not just with your eyes. What I’ve been forgetting to do that I’ve been meaning to do is some more long exposures – I’ve had the Lee Big Stopper (10 stop) for more than a year now and have lots of things floating in my mind, but have used it probably less than half a dozen times. Needing to experiment with the different ways to use the filter and not be limited to the cliche’s.